This is the perfect place for a relaxing holiday or an ideal base for property hunting. Located on the edge of the peaceful village of Champagné le sec which is surrounded by fields of sunflowers and local crops. There are numerous way-marked walks of varying lengths. All on flat terrain, so not too strenuous and no need for hiking boots! Just take a picnic and enjoy strolling through the local hamlets and admiring the countryside. If you prefer a gentle cycle ride, we have bikes available on request. You'll have use of a BBQ and a dedicated seating area with table and chairs. You are also welcome to make use our orchard and sample as much of the seasonal fruit as you can eat!! There are three major supermarkets within about ten minutes drive. The local town of Civray (10 minutes) has bars, restaurants and a twice weekly market and even a cinema which sometimes shows English films. You'll also find the new indoor/outdoor pool open seven days a week. If you are property hunting, you will be located in the south Vienne, ideally situated for property searching in the Vienne and Deux-Sevres departements. Just five minutes drive from the RN10, the main route between Poitiers and Angouleme. We're always on hand to help with your property hunting needs. Having found ourselves in a position to fulfill a long standing ambition, we set off on an adventure to relocate to France. After searching the area for a while, we found our beautiful house on the edge of Champagné le Sec. We bought it and came to live in this beautiful part of rural France in 2013. We settled on this area for numerous reasons. Firstly, because of it's reputation as the second sunniest place in France!! Also, because of its proximity to Poitiers airport (36 minutes), Limoges airport (90 minutes), the RN10 (five minutes) and its outstanding beauty and tranquility. It's handy for shops and supermarkets, easy to get to the airport and we can be on the RN10, which is the main route from the North of France down to Spain, within 5 minutes. Once we'd moved in, we immediately set about creating the holiday gite we've wanted for such a long time. We hope you'll enjoy your time here. We love the traditional Charentaise Longere style. Ours is a beautiful example which we hope to renovate and restore. It's in a fabulous location in the heart of rural France and it gives us the space we've always wanted..
En-suite to the bedroom featuring exposed stonework with a toilet, washbasin and shower. Electric radiators upstairs and down. Washing machine in garage for the sole use of guests. Plenty of space for your car. A pretty two seater settee and chair, books and TV. Fully equipped with electric oven, gas hob, fridge freezer, microwave, toaster, kettle pots & pans and just about everything you will need to create sumptuous meals. As you can see on the photo's, a lovely dining area ready for romance! Large flat screen telly with English Freesat. We can make bicycles available upon request. Please let us know in advance if you'd like to cycle. We can also show you enjoyable routes of varying lengths through our forests and local hamlets. There are tennis courts at St Macoux, about ten minutes away. Whilst we are happy to accommodate smokers, we ask that you respect our future guests by not smoking in the bedroom and allowing plenty of ventilation. We can provide packed lunches and breakfasts upon request. Please don't hesitate to ask us if you'd like to know more. If you are looking for a relaxing quiet time away from the hustle and bustle of city life this is the place to come. Very relaxed with great hospitality. Mark and Lesley are lovely and make you feel at home. The accommodation has everything you need. Small village 2km up the road gives you a chance to practice your French - I hope it's better than mine ! Bigger town Civray 10 km away which is quintessentially French and very picturesque. My advice it take it easy,relax and make sure you've got an adequate supply of fantastic Bordeaux wine in stock. Bon Voyage. Thank you for your kind review. It was our pleasure to have you staying here at La Greletterie, we enjoyed your company. It's nice to know that you spent a relaxing time in our gite and that you enjoyed exploring our lovely part of the world. You hit the nail on the head: take it easy, relax and enjoy the Bordeaux! We hope to see you again sometime! The Gite is very comfortable. The kitchen/dining and lounge area is well planned with all you need and decor is very nicely done. Upstairs is the bedroom and en suite which is spacious, with high ceilings, timber beams and a very comfortable bed and the decor is beautiful. Outside is a lovely courtyard with table and chairs, comfy loungers to relax on and flowering plants all around.The owners,Lesley and Mark, are very welcoming and hospitable,with advice on interesting places to visit ( also supplying us with a welcome bottle of wine, homemade jam -which was delicious-, cherries and walnuts!) There are plenty of places to visit if you like to get out and about.We visited the excellent La Vallee des Singes -Valley of the Apes- which is defiantly worth going to- and the Crocodile Planet.We explored lovely villages, historical buildings,towns, parks and lakes, and went on walks in the beautiful french countryside to name just a few of our adventures. A very enjoyable holiday. We're delighted that you enjoyed your stay with us. It was a real pleasure to meet you both and we hope to see you again sometime in the future. We stayed in this gite from 16th to 22nd September whilst we were house hunting in the region. Mark and Lesley are lovely, lovely people and nothing was too much trouble for them. 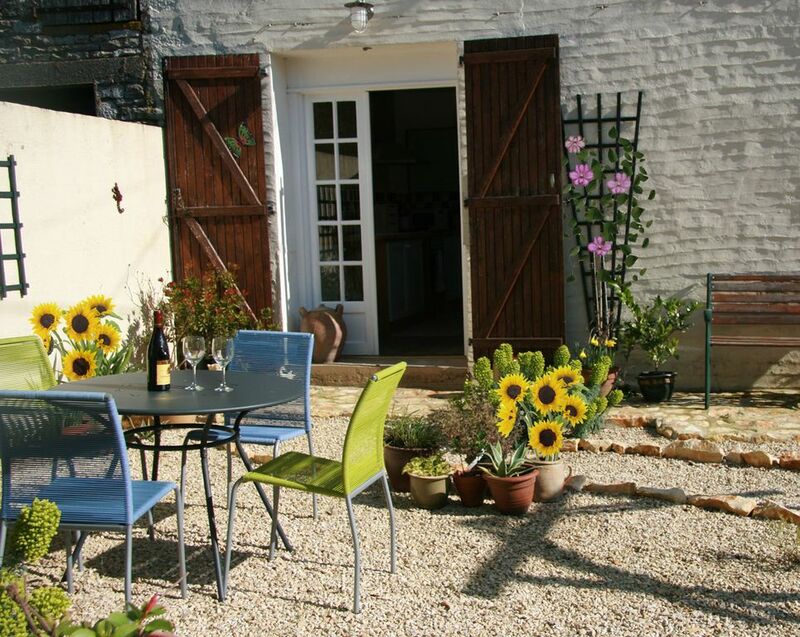 The gite itself is pretty and very well maintained with all the facilities you need. Our last evening was spent enjoying good food, wine and conversation in the garden outside of the gite with Mark and Lesley (and other previous guests who are now their friends). excellent séjour dans un cadre calme et fleuri. Lesley et Mark sont avenants, agréables et disponibles, toujours à l'écoute de vos besoins. La cafetière électrique est déjà disponible dans le gite. Nous espérons de vous revoir bientôt! Bonne chance avec votre achat.